It’s no exaggeration to say that as a disruptive technology, Artificial Intelligence (AI) is set to change the world – and is already making a positive mark on industries such as healthcare, automotive, gaming and manufacturing. So much so that in this year’s Founders’ Letter, Google co-founder Sergey Brin described “the new spring in artificial intelligence” as “the most significant development in computing” in his lifetime. Its proliferation is an inevitable consequence of years of ongoing research, refinement and application. Underpinning all of this change – and often overlooked – is High Performance Computing (HPC) and the programmers who use it to power their AI and Machine Learning (ML) applications. AI is not without its doubters, and much of the conversation around its increasing adoption has so far focused on its potentially negative impact on employment. However, with the World Economic Forum (WEF) recently predicting that AI will create almost 60 million more jobs than it will eliminate by 2022, it’s time for a swift narrative rethink. Rather than replacing jobs, the introduction of AI should lead to learning new skills; of moving from manual work to computer skills. By providing workers with the right skillset and training, jobs may change, but they won’t be lost. For example, smart factory employers are training their workers to manage autonomous machines in order to stay competitive. Like everyone else, programmers are having to develop new skill sets and thought-processes to keep up with rapid advances in the AI space. To build AI and ML-enabled applications, many use popular frameworks developed by the likes of Google and Microsoft. However, once created, these apps need to be integrated into an organisation’s existing infrastructure. This is where HPC is fundamental, offering an ideal platform for the job. HPC is the process of gathering computing power in a way that delivers a much higher performance than an average desktop computer. 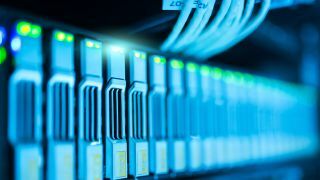 The acronym HPC can actually be used in two different, albeit interrelated, ways – it can refer to High Performance Computing or High Performance Computers. High Performance Computing is often discussed in conjunction with supercomputers – powerful and expensive machines built by companies such as IBM. These are typically designed to make ground-breaking discoveries in medicine, science and engineering, such as curing cancer and uncovering earth’s origins. A particularly well-known example of an organisation that uses supercomputing is NASA. Its supercomputer, Pleiades, is involved in projects from detecting asteroids to identifying earth-like planets. HPC’s use is not isolated to supercomputing and space-related missions. Crucially, after building AI and ML applications, programmers are able to run them efficiently on a HPC infrastructure. Often a combination of hardware and software, HPC is able to cope with and analyse the massive amounts of data typically associated with such applications, providing the speed and performance they require. Take healthcare for example: HPC-powered AI is being used to diagnose patients, offer treatment plans and prescribe personalised medicine in a matter of seconds. To say this technology will change lives is no longer an understatement. Meanwhile, automotive companies such as McLaren Racing are using a combination of AI and HPC to gather data on the car, the track, and more – in real time – to fine-tune a car’s engine mid-race. As AI apps become smarter and more sophisticated – using more data – the need for a supportive HPC infrastructure will continue to grow. And going forward, as more use cases for AI-powered HPC emerge to solve critical problems, this technology will fundamentally change how the programmers behind the scenes approach computing.